Honolulu Hawaii Pressure washing company, Kailua Pressure Washing company, Window Cleaning, Mililani power washing, Kaneohe, kapolei, Windward Oahu, Ewa beach, waipahu, Pearl city, Manoa valley, Nuuanu - professional power washing service! 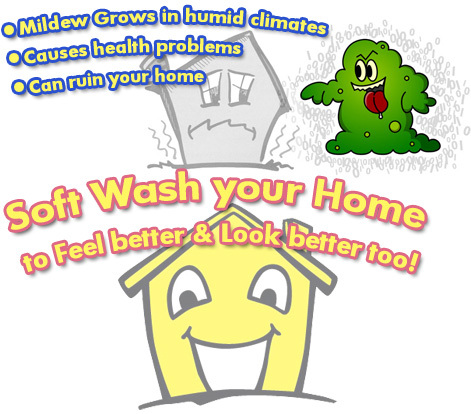 How does mildew/mold get on your house? Mildew grows best in warm, humid climates. Mildew is the visible part of very tiny plant life called fungi. Mildew can grow on paint because, first, paint may contain organic materials that nourish the plant life and, second, organic material floating in the air falls on the painted surface to become food for mildew. Dirt, is also an enemy to any paint job. Dirt, soot or soil is easily distinguishable from mildew. Though certain household cleaners can be used to remove mildew, commercially prepared washes kill mildew and cause mildew and dirt to release from the surface. Once you have removed the mildew and dirt from your home, you may find that the home looks fresh and attractive and you may even forgo a paint job this year. Below is an episode from the TV series King of Queens talking about a mold problem they have inside their home. We do not do hazmat removal which is what would be required in this situation but the fact that mold is a hazard whether inside or outside your home.